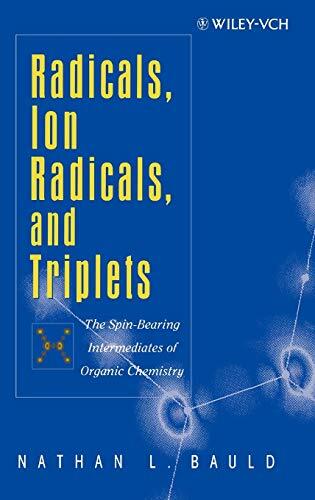 Radicals, Ion Radicals, And Triplets: The Spin-Bearing Intermediates Of Organic Chemistry: 9780471190356 Hardcover - LIMEROCK BOOKS INC. Written by an internationally acknowledged expert in the field, this book provides an overview of all major types of spin-bearing radicals, important intermediates in organic reactions. Many new synthetic methods involving radicals have been developed and discussed in the past five years; this is the only source book that focuses on the physical-organic aspects of radical chemistry. Suitable for students and professionals in chemistry, biology, polymer science, and environmental science, this book is an indispensable guide to the rapid growth area of radical chemistry. Shipping costs are based on books weighing 2.2 LB, or 1 KG. If your book order is heavy or oversized, we may contact you to let you know extra shipping is required.Some books may be shipped from India.